The World Looks Red: Win 40$ to spend at Beta Boutique! I told you I'd do something special when I'd 1250 followers! So me and my lovely new sponsor Beta Boutique whipped up a little giveaway as a thank you to my dear readers. 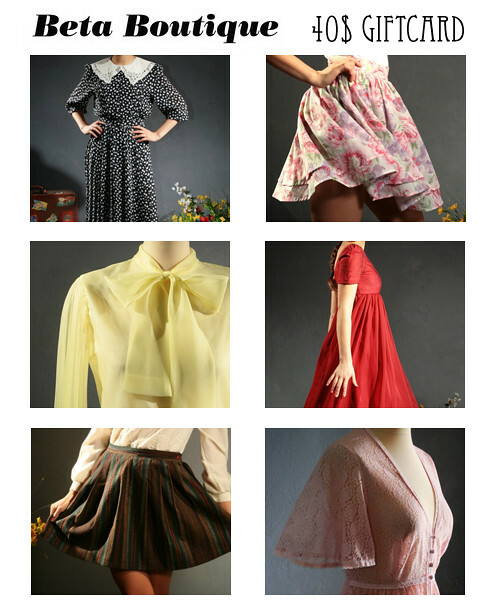 I love vintage, you love vintage; so I'll know you'll love this shop. Besides the boutique stuffed with pretty frocks, skirts, pumps and purses, there's Beta Accessories (for scarves and jewelry) and Beta Por Homme (for your beau or the few men reading this blog). Make sure you're following this blog (on Google Friend Connect and/or Bloglovin'). Leave a comment, letting me know what your favorite item from the Beta Boutique is. For an extra entry, follow @BetaBoutique on Twitter for shop updates, sneak peaks, special offers, impressions and inspirations. The winner will get to spend $40 on dreamy dresses and whatever they wish, except for the handmade items in the shop. The giveaway is open until 7th of February, 8PM GMT. A winner will be chosen using random.org. vintage flapper dress. So beautiful! This is cute: http://www.etsy.com/listing/55726862/vintage-50s-twiggy-style-navy-and-white. 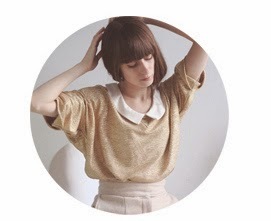 And, I follow via Bloglovin. My email: timeenoughfordrums@yahoo.com. hum. they have way too many things to chooose from. my favorite would have the be the '80s cranberry poncho coat! so sick. i am already following you via google :) i have followed betaboutique twitter. look forward to hear who wins! This romantic white blouse is so beautiful. I already know what I'd wear together with it. It took a while to pick out a fav (there's lot of awesome items on Beta Boutique).. but I love this Caramel Slouchy Satchel (http://www.etsy.com/listing/41252180/vintage-caramel-slouchy-textured). It's such a perfect bag!! Crossing fingers and toes! And of course I follow you (GFC). Thanks for hosting this giveaway! Oh gosh, how to choose? I am so in love with this romper! I follow and love the Vintage 1960s FOREST GREEN velvet dress, Audrey style, sleeveless with bow, size Medium. Makes me think of Joan from Mad Men! And I already follow your blog. My favorite item is the high waisted floral abstract watercolor skirt. I love Vintage cinnamon BROWN LEATHER cowboy or cowgirl ankle BOOTIES...and they're just my size!! Gosh Choosing 2 favourites is a big ask, they are all so lovely! The Vintage 70s hand made granny style crotcheted top. So cute and quirky! I've had my eye on it for a long time. Yay! I love Beta Boutique. I got one of my favorite dresses from there. I also followed Beta Boutique on twitter. I really love the Vintage striped SCHOOLGIRL mini DRESS in blue and white with empire waist, size XS, Petite. I am also following them on twitter. Congrats on the followers! Good luck for the future. I love your blog! Would love to win this! Amazing boutique! wow, what an awesome giveaway. :) i love the vintage cowboy boots. Ohh what a great gift! Okay I am following you on google, following them on twitter and here is my favorite item. Such a cute bag! I am in love with cross bodies right now. and the skirt in your picture! I follow U on Google Friend and Bloglovin. It's so adorable and unique! One of my fav items from the store is this here bag: http://www.etsy.com/listing/63964640/vintage-burnt-brown-and-black-equestrian I think it would make a really good everyday bag. Wow I love this shop! my favorite item is the BACK TO SCHOOL vintage NAVY blue SCHOOLGIRL dress with ACOORDEON PLEATED PETER PAN collar (here: http://www.etsy.com/listing/28032207/back-to-school-vintage-navy-blue) this dress is just sooo perfect! Congrats on the followers!!! And what a great giveaway! My favorite is the Amelie style dress! Such a beauty! oooh you always bring wonderful sites to my attention! it's absolutely gorgeous and what a colour. a lot of the skirts caught my eye too. quite a lot to choose from tbh. I love the WHITE silk Bradshaw style tu tu skirt. I absolutely adore the high waisted floral abstract watercolor reconstructed mini, and the black velvet bodycon dress! I would definitely wear either of them.